With warmer weather here, a lot of us are going through the annual invasion of ants into our homes. Trying different means of eradication helps you find what works best for you. I like raisin bran flakes. Usually, I have a serving every day. An opened box that wasn't tightly resealed was the perfect invitation for scout ants to tell the others, 'Hey Y'all, I've struck it rich. Just follow me to the gold mine'. I haven't gotten into spring cleaning full scale, but I am doing a little here and there. And I have cleaning supplies scattered about. Clean or not, the kitchen sink seems to be the first place you'll find newcomers looking for a morsel large enough to warrant alerting the others. When I saw a trail of ants headed down a sink bowl, I wondered what they could be after. I think it was some powdered coffee creamer. When you're pouring it into a cup, some of it becomes airborne and settles about. So, I usually hold my cup over the sink while pouring the creamer into it. Whatever they were after, they were coming in a steady stream. I picked up a nearby spray bottle of vinegar and gave the lot a big spritz. In two minutes, they all were motionless. I wiped them up with a paper towel. Within twenty minutes, I had to repeat the procedure. I kept this up off and on throughout the day. At bedtime, they were still coming. I decided this year was going to be a bad one for ants. The next day was a repeat of the day before. Within my arsenal was a spray bottle of ammonia. I gave that a try. It was just as effective as the vinegar and maybe worked a little faster. I like the idea of a spray bottle, none of the ants escape. My only problem was, new ones kept coming, lots of new ones. By day three, things were out of control. The ants were coming faster than I could spray them. Clearly, spraying just the ones I saw was not getting me anywhere. Then I remembered, they must be stopped at the source. 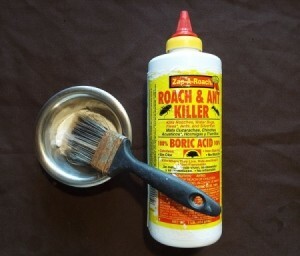 Time to pull out a tried and proven ant killer, good old boric acid; something I should have used right from the beginning of the invasion, but simply forgot about. A container of boric acid, a small saucer or something disposable to hold the acid, and an old brush used just for this purpose is all you need. Dip the brush into the acid and flick the brush over the trail of ants. A light dusting is all you need. If the dusting is light enough, the ants will continue to congregate and feed. Eventually, the ants will return to the nest (minutes to hours) and contaminate it with the acid. If you are sure you dusted most of them, you can shoo them away and clean the area with a damp paper towel. This is what I did. Within hours, the number of new ants arriving decrease dramatically. I dusted them periodically throughout the day. Within two days, the ant traffic had completely stopped. I'm sure that's not the end of my problem, though. Sooner or later, scouts from another nest will find my kitchen and the fun begins again. 'Yea, the poor will be with you always'. Seems the same could be said about ants. It's good to know though, that you can keep their numbers small to almost non existent with a bottle of boric acid, a saucer, and an old brush. It would cost a small fortune to keep the grounds around my home constantly exterminated. I figure the next best solution is a dollar bottle of boric acid from Dollar Tree. This method truly works. Just remember, it will take two-three days for the dusted ants to contaminate and kill the whole nest. If you see more ants after that, it's likely they're from another nest. Do you think this would work with gnats? They arent fruit flies. No, Judy, this wont work with gnats. I sure wish it would. If you have house plants, gnats are probably breeding, or at least congregating, in the soil. If you dusted boric acid on the plant soil it would kill the gnats, but would burn and probably kill the plants when it is taken up into the plant. I take my house plants outdoors (in a shaded area) on nice mornings and drench the soil with Malathion (the same dilution as would be used on the plant leaves). This will kill any gnats in the soil and prevent others from coming in. Malathion is great but it has a strong, disagreeable odor. That's why I do this outside. By evening most all the odor will have subsided. But, even this will not help with the occasional gnat that comes in just by you opening a door. There are trillions and trillions everywhere. I am still trying to find that perfect deterrent which will keep them from biting my ears. A spun hair net has proven to be the best to date. Gnats! For something that will give temporary relief try one of the old fly tapes you pull out of the cylinder and thumbtack to something/ceiling. It works but only covers a small area. Talcum powder works just as well. Ants won't cross it. find the entry and put some there. Put it across the threshold of your doors. You can even put it on the outside of the door. It always works for me. Can you still buy talcum powder? I believe so because I keep seeing new bottles of it in our bathroom. Thanks for this tip. I also need one for gnats! Yes. Baby powder will work. I really enjoyed your letter. I'm going to try this, this coming season.